Finding the highest quality, requisitely sized and most affordable astrological quality gems is a vital and no simple matter. Very few jewelers are knowledgeable about Ayurvedic prescriptions. Few are trained in gemology and so know little about the common crystal material-altering practices or gem color-enhancing processes of commercial opportunism so common today. Even fewer understand the importance of the specific quality of the gems required or how they must be set to maximize their effects. Jewelers often have difficulty in following the essential instructions of fashioning a jewelry piece with the gem set to make good skin contact. Synthetic or imitation materials are sometimes mistakenly offered as natural stones without explaining the difference between these and the far different laboratory-grown crystals. For most people not knowledgeable about gems, trade names and claims of quality can be misleading and cause them to purchase lower quality and therefore ineffective materials. In as much as this situation exists, I have made it my priority to provide the highest-quality and lowest-priced astrological gems and metals. With a lifelong interest in both geology and gemology, I have earned several certificates in gemology, which is always an ongoing study. With a background as a founder of a mineral exploration company, I have maintained a working Gemological laboratory since 1991. Combining my interests in both yoga meditation (20 yrs)and gemology, it is my goal to offer the highest quality affordable astrological jewelry of my own designs (particularly nine-gem bangles) which have been made for the past five years with numerous testimonials about their profound effectiveness. Even in India, very few astrologers have extensive experience with two carat-plus, nine-gem bangles. This is because of the prohibitive cost associated with purchasing several gems, and the expense of high-quality gems in relation to the recent overall weakness of that nation's economy. Over time, little understanding has been retained due to this lack of comprehensive observation of how the appropriately sized gems work synergistically, complementing each other in a holistically strengthening karmic manner. We are moving out of a lower age's influence and my research overwhelmingly suggests that the efficiency of nine-gem bangles should be more deeply explored. From my unique experience, I know the importance to prospective buyers of finding the most affordable and highest-quality gems and metals available. It is my goal to offer my customers eight-gem bangles (without the diamond) at the widest possible budget range, (starting as low as $1500), using the quality gems available. My unique link-to-link design (as shown on the home page) allows customers to purchase partial bangles, add stones singly combination, upgrade the size and quality of their existing stones, or purchase complete navaratnas. As a service to potential customers, I have written this booklet to supply information and to answer the most common questions about obtaining high-quality, effective astrological jewelry. Before purchasing a bangle or other astrological jewelry, it is important to determine which gems would benefit one the most, the size and quality of the stones, how and where one wants to wear the jewelry, the amount he or she can afford, and how to order. It is highly recommended that a prospective navaratna wearer obtain a full nine-gem planetary analysis from a reputable Vedic astrologer. To do this, time, date and place of birth is required. I know of qualified Vedic astrologers who provide this excellent service. Once you have decided the kind of gems you need and their desirable size, it is important to decide on the quality you want. For remedial astrological purposes, in my experience the weight of the material is far more important than the perfection of the cut. Of course you would like the best-quality stone that you can afford. Quality is determined by color, cut, and clarity. Generally speaking, the closer a stone approaches its specific rainbow color, the color in the spectrum of natural light, the more potent it will be. Color may be more or less intense. Depth of color with clarity is usually more expensive. After weight the next most important quality is clarity. For a gem to have an uninterrupted electromagnetic resonating signature, the alignment of its atomic structure should be unencumbered by inclusions. Inclusions are tiny disturbances to the growth process of the gem crystal such as growth lines, internal cracks (pressure fractures, healed or not), sub-crystals, foreign matter and other internal disturbance phenomena. These will affect the transparency, dispersion, and brilliance of a gem. The less included, spectrally color-perfect and heavy a gem is, the more expensive it is likely to be per carat. Of course, the proof of a stone's quality is the effect it has on the wearer. I solicit and highly value the feedback of my clients in regard to the stones I sell. Obtaining the best-quality material is my ongoing concern. As a dedicated buyer, I have traveled to mines in Sri Lanka, Australia, and centers in Thailand and India. I also regularly attend world trade gem shows. Over the years, because of high volume discount purchases from overseas contacts, I can offer my customers the best quality gems available at the lowest prices. The next consideration after exploring type, size, and quality, is how best to wear your gems. By far the most convenient and effective way is with an arm bangle. My design concept maximizes uniform and continual contact with the skin and provides room for a comprehensive array of stones. In essence, a bangle is similar to a shield, constantly defending the wearer from portions of his or her own negative karma. The combination of gems electro-magnetically assist the chakras when they are not able to appropriately respond to planetary stimuli due to past negative behavior. In addition to allowing for the wearing of the widest possible combination of Ayurvedic gems, another advantage of the link-to-link bangle (refer to front page artwork) is its ability to be upgraded or adjusted. Many people cannot afford complete nine-gem bangles initially. This is because they understand that the stones must be over two carats and of good quality or they are of very little benefit. Fortunately there are certain stones that can be acquired very inexpensively. These less-expensive stones - coral, pearl, Hessonite garnet, and laboratory-grown-crystal ruby and emerald - have the benefit of immediately providing a good balance. If the Vedic astrologer's analysis is favorable, the gems can form a beneficial foundation for the complete navaratna as time and budget permits. Bangles may also be lent to friends and loved ones during periods of particular difficulty, a wonderful and helpful gesture. Pendants set with gems are not highly recommended because they have a tendency to bounce around, and do not maintain the continual and well-grounded skin contact so essential for astrological jewelry to maximize its effects. On short chains, the pendants have better skin contact but are often uncomfortable to sleep in. I highly recommend coral and pearl necklaces for their respective healing and calming effects. Many testimonials I've received have been remarkable. One would do well to have one of each in the first-aid cabinet, to be used as therapeutic aids. Rings have been a popular type of astrological jewelry because they are small and are designed to hold a single gem. In the past Vedic astrologers, mindful of the low availability and high cost of precious stones, (once prohibitive to the average person) often recommended obtaining only the most afflicted planet's corresponding Ayurvedic gem. The logic being that it was best to spend one's gem budget to defend oneself against the most malefic planetary influence. Unfortunately, in our horoscopes planets move in and out of benevolent and malefic positions. These planetary positions are constantly changing. Since there are main and sub periods and sub-sub periods, etc., we are always reaping karma via the planets on some level. Therefore it is most helpful to wear the complete set of Ayurvedic gems. One gem cannot offer maximum defense against afflictions that occur during these cycles. The practice of using only one or two stones has continued not only out of economics, but also because of habit, custom and lack of empirical observation to the benefit of multi-gem bangles. When the adhesive power of the body cells becomes lax with the advance of old age, the planetary pull becomes stronger, causing more laxity of the body cells. This invites disease and mental disturbance. Gems and certain pure metals counteract negative planetary vibrations and enhance strong ones. After five years of intensive observation, research and experimentation with five to nine-gem bangles, I have developed an appreciation for their power and value and have distilled a clear viewpoint out of much seemingly contradictory material. As yet, I have not met anyone with as much experience in nine-gem bangles (navaratnas). Of course, if one desires several rings, wearing an assortment of astrological gem rings is a stronger partial remedial solution, but one may tend to look like a museum piece! Other problems with rings are myriad. Rings may not be in character or style with the person wearing them, and are not always conducive to one's occupation, sports participation, or social setting. Also, the softer stones in rings often get scratched, and rings or their stones are more prone to loss than are larger jewelry items such as bangles. In addition, the ring setting and finger sizing can add considerable expense per gem without offering any additional planetary protection (money that could be better spent on additional or better gems). Finally, astrological gem rings, with their formidable power, cannot be readily shared with others, unless of course friends have the same ring sizes (an unusual occurrence). Rings are, therefore, seen as very helpful, but with limitations not shared by bangles. As with any quality jewelry, some attention must be paid to aesthetics, but I try to change the paradigm that many of my clients have concerning Ayurvedic Astrological Jewelry. As an instrument for negative karmic mitigation and nullification, astrological jewelry needs to be designed to maximize comfortable, continuous skin contact and be durable to wear and tear. It must be crafted to last, and therefore, I make my jewelry with the intent that it will be in great condition to pass on to a loved one when it is time to leave your mortal frame. Of course this doesn't mean I completely ignore creating attractive jewelry. It would be foolish to do so as a bangle is a lifelong investment and should be a thing of pride and artistry. Over the past five years I have made great progress in design and improvement in material, settings, links, size and comfort. I find working with gold (for those who can afford it) creates a thing of beauty by its sheer color, so naturally I offer items in various metals and grades. After gems are purchased, customers have the option to personalize their own jewelry by working directly with my jewelers. 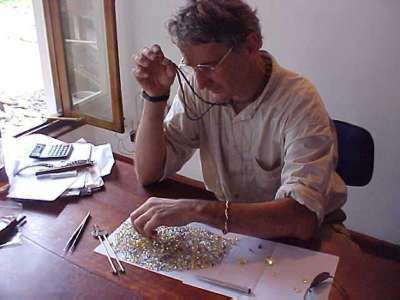 NICK IN SRI LANKA HUNTING FOR UNHEATED UNPROCESSED NATURAL YELLOW AND BLUE SAPPHIRE CRYSTALS FOR FACETTING. I often visit different gem mining areas around the world that offer the best prices for natural unenhanced ayurvedic astrological gemstones. This video discusses some of the procedures hunting for the the appropriate gem crystals while in Sri Lanka. So many individuals purchase astrological gems and discover they feel nothing. This video gives a detailed explanation on why purchasing gems for Navaratna is a very tricky process in a world of enhanced gemstones. I briefly discusses some of the many pitfalls the uneducated buyer is very likely to experience. By using an example of a broken and poorly made bangle that came to astrogems to be re-built and changed into an effective bangle.. Nick goes through gem by gem explaining the mistakes his well intentioned client made..